You’ve a plate full of colourful vegetables, a tasty protein, maybe a bed of hearty grains, all chosen and cooked with care. You add a sprinkle of fresh herbs and some grey sea salt. Lovely. But you worked late and the kids have hockey, and so you forget the one ingredient that ensures this meal is as healthy as it can be. Every time you rush around clearing the list, shuttling the kids, meeting the deadlines, your breath takes a back seat. Every time you let your worries get the better of you, and you get lost in your head, in a tailspin of overwhelm and fear, your breath is an afterthought. You know from yoga, from Pilates, from running, from working out, from meditation, that the breath is how you stay connected to your body. It’s how you manage your pace. It keeps you energized through the tough bits. It’s how you stay anchored in the present moment. Those same perks of breathing apply when you get home from the gym or the studio. They apply when you sit down to eat. Yes, taking the time to breathe between bites will slow you down, letting your digestive system get in on the game. It’ll give you a chance to notice when you’ve had enough. There are also physiological benefits to conscious breathing before and during your meals. Taking a long, slow, deep breath reduces stress. The stress response, aka fight or flight, isn’t conducive to digestion – you would never stop for a snack while being chased by a predator or battling a foe. Though there may not be enemy tribes pillaging your village, your body reacts the same way in the face of an angry customer, your son falling out of a tree or being cut off in traffic. Regardless of the quality of the food on your plate, your body can’t break down, absorb and assimilate the components effectively if it’s not relaxed. Taking a long, slow, deep breath engages the relaxation response, aka rest & digest. You might even settle down enough for some pleasant conversation! Your breath – oxygen specifically – plays a major role in how efficiently you use your food. Other than the nutrients that go into the maintenance & function of your body, most of what you derive from food is energy (calories). The carbohydrates get dismantled into glucose; under certain conditions, fat and protein get converted into glucose. Inside your cells, that glucose is burned by oxygen (in a process known as cellular respiration) to release the energy stored in its bonds. Breathing consciously before and during a meal oxygenates your blood for maximum energy production. Incidentally, if you’ll forgive me a little geek-out here, that energy is the sun’s heat and light that have been bound with carbon dioxide and water by plants eating and breathing. It’s perfect symbiosis: the plants had exhaled the O2 you need, now you exhale the CO2 they need, and you shine the sun’s light right back out to the Universe. Your digestive tract contains a large part of your nervous system. As such, it works according how you approach, experience and react to life. Think of the times – like when you’re on holiday – and you can eat whatever you feel like without repercussion. Then you get home and you sneeze with the first piece of cheese or bloat from the first piece of bread. Your digestion is also where you take in products from the outside world – plant or animal – dismantle them, and rebuild them according to your current needs. It’s how you literally create your (human) body. So, you could say that digestion is an expression of your humanity, of your uniqueness, of who you are. Now the breath brings you into deep connection with your body; with its feelings and emotions. While you may think of those as secondary to your health, they are, in fact, vital to your survival. Fear tells you when to move back. Joy & love compel you to move forward. Anger is how you protect yourself and your loved ones from harm. The feelings (or your felt senses) are clues to what works for you and what doesn’t. When you sit through a job interview feeling tight in your chest, shoulders curled forward, it’s an indication this place may not be the best working environment for you. As opposed to an office that leaves you feeling open, with head held high. Knowing how you feel in a situation, or after having eaten a certain food, is exactly what listening to your body is all about. It’s one way to get to know yourself at a deep level. Noticed with this in mind, your feelings and emotions act as beacons to where you need to go – be it with food, other health-related decisions, relationships, work, where you live, how you play, etc. Taking the time to breathe – to get in touch more fully with your body, to get to know yourself and express who that individual is – your body will in turn manifest who you are from the inside out. That manifestation happens through your digestion. You’ll have less bloating, better energy and feel more satisfied after your meals. You’ll be connected to your body, be fully energized and stay anchored in the present moment. All essential ingredients for enjoying and assimilating your meals, your life, and moving more fully into vibrant health. ** When you sit down to a meal, before you make a difficult call, before you step into the big meeting or onto the stage: breathe in for a count of 7, hold for 7, exhale for 7. Do this 3 times. One minute to feeling more relaxed and grounded. Take a deep breath and go ahead and tell us how it makes you feel right now. When you share in the comments, you open the possibilities for others. Give your friends a taste of this simple health tip by using any (or all!) of the buttons below. There was a moment with the client I had the other day – she’s by no means the only one who does this – when she was hit with the reality that there’s no magic bullet. She won’t leave my office with her pants feeling miraculously looser any more than one day without gluten will see her through every meal without bloating. It’s the point when she realizes that achieving her health goals will involve choice and commitment every day. It’ll take effort and persistence both inside and out. As we talk more, and I learn more deeply about what she wants – how she wants to feel – I watch as that sense of burden transforms into hope: she can do this! It’s not only possible, it goes above and beyond her desire for more energy, less weight and easy periods. While it may take a couple of months to ease her symptoms, this is something she can have today. That something is Vibrant Health. Vibrant Health is being connected to your body – aware of sensations, emotions, likes & dislikes, and using them as beacons to where you want to go in life. Vibrant Health is engaging with life sensually: with all your senses. Tuning into the colours, smells, sounds, textures, tastes all around you, and letting them guide your decisions. Vibrant Health is a state of balance – physically, mentally, emotionally, spiritually – the wherewithal to navigate daily challenges with grace. Health isn’t static or finite. We act as if it’s indelibly lodged in a certain weight, a lack of disease or the ability to complete a half-marathon in under 2 hours. I watch people run the race for health in frantic attempts at perfection, fearing that one step in the wrong direction will have them tumbling back to square one, or worse, an early grave. Regardless of how much you weigh, how many cookies you eat, whether you opt for organic (or not), it’s possible to be healthy. Health isn’t an absolute. Like anything in life, once you arrive at your intended goal, more doors will open to lead you towards the next big thing. This is natural and to be expected. As you create new habits and discover who you are underneath those symptoms – as you grow and expand into who you want to become – that new version of you will have a whole new set of priorities and desires. Vibrant Health is the joy you feel knowing you’re doing everything you can, in this moment, to be as helathy as you can, to live the life you want. Vibrant Health includes knowing you’ve got what it takes to make positive changes on your own. Vibrant Health goes beyond food and exercise. Yes, whole food choices play a huge role; they’re part of the inner shifts that create the glow as you blossom on the outside. As promised by miracle detergents, Vibrant Health turns the washed-out version of your life into the vivid colours you’ve always imagined. Vibrant Health isn’t a destination. It’s a journey. Like any journey, it takes planning, time and perseverance. Like any journey, you get where you want to go one step at a time. Like any journey, you’re the one who has to take those steps. As with any professional who helps you along the way, my role is to act as your guide, showing you the simplest path. Because it’s my desire to see women all over the world expand into a state of Vibrant Health, I’ve come up with a recipe to get things cooking. Enter your details here and I’ll send it to you. In the meantime, tell us what your vision of Vibrant Health looks like. When you share in the comments, you open the possibilities for others. This isn’t about telling you to do more physical activity. You should know that I’m not the kind of gal who’s going to tell you to eat less and move more, to move for the sake of moving. Yes, I’m gonna tell you to get your body in gear. But I want you to know why you’re doing it and which types of movement will serve you best. If you change nothing else in your life, but add a half hour of physical activity 5-6 times a week, you’ll lose weight. Even if the number on the scale doesn’t budge much at first, notice the fit of your favourite jeans or the way your dresses fall as your body composition shifts. Articles and studies abound in the ways that exercise will boost prevention, management and healing of many disease conditions. Stabilize blood sugar, improve bone density, circulation and digestion, lift depression and ease anxiety – all as if from a magic pill. If you want the details on any of these concepts, by all means, Google away! It’s kind of a no-brainer: The human body was made to move. Your muscles and joints are part of a complex system that ensures your survival. Traditional societies got through by hunting, farming, building, walking, climbing, hauling as part of daily life. Your cells and their exquisite machinery are in constant motion, generating proteins and manufacturing energy. The amoeboid migration of immune cells, the peristaltic flow of digestion, the exchange of ions and release of neurotransmitters throughout the nervous system, the shifting of proteins in the dance of life: it’s all movement. The molecules that make up your cells, the atoms, are containers of energy, vibration. Movement. As much as we love our modern conveniences, they physically deprive us of an important aspect of our very nature. We deny the body its joy, and experience a breakdown in optimal functioning because of our current lifestyles. The breakdown doesn’t stop with physical ailments. Mental health is also at stake. I look at the growing number of kids with ADD & ADHD compared with the dwindling time they spend running around outside. I look at the rising numbers of adults on meds for anxiety & depression compared to the number of hours we spend sitting in offices. Yes, these are multi-factorial conditions, but like diabetes, physical activity is a key factor. Mental-emotional issues have a deep root in the fact that we suppress, repress, negate and hold back our feelings. No surprise there. How many of you were actually given the space to have a full-on tantrum or bawl uncontrollably or rip apart your bedroom? I’ve said it before and I’ll say it again: emotions are energy-in-motion. The best way to clear the anxiety around that upcoming thing, to dispel the fury boiling in your gut after that fight, to loosen the grief binding your heart is to move. Feel right into it, then do whatever it asks of you. Go for a run, punch a pillow, dance around the kitchen like an idiot. Whatever. Like a wave, the emotion will swell, peak and wash away in peace. Getting back to the type of movement you “should” do. Like with food, we tend to think that there’s a good and bad. OK, there are right and wrong ways of going about certain activities. What I mean is that it’s not about getting to the gym 3 times a week, running marathons and driving yourself hard at boot camp. That whole “No pain. No gain.” thing is rather outdated. As much as I get nostalgic for ‘80s music, there are some things – along with zippered jackets and big hair – I can do without. You’ll notice that I’ve avoided the word “exercise”. That too conjures up bad memories of cramps and frustration, and feeling like a failure during the Canada Fitness Test. Truth is, it doesn’t really matter what you do. Your body works differently than mine – your idea of invigorating won’t necessarily be the same as mine. One winter I joined a circuit-training gym to stay in shape between biking seasons (my main transportation for years). Sure my legs stayed strong but I was freezing cold for 4 months straight. That type of exercise was too draining for me. I adore yoga, but the thought alone of doing it in an over-heated room makes me wilt. Find something that works for you, for your constitution and your lifestyle. 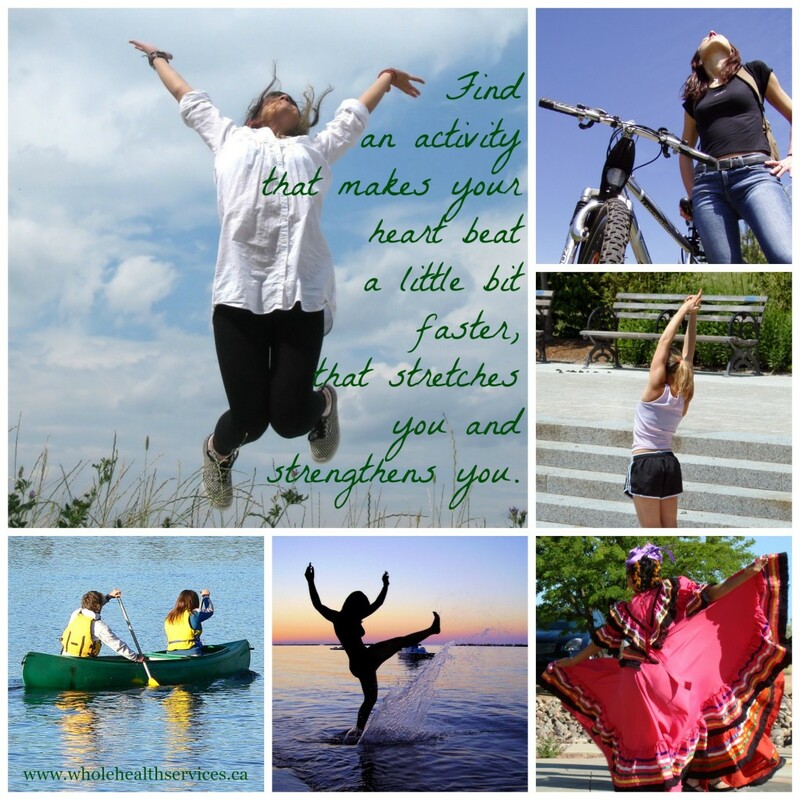 Find an activity that makes your heart beat a little bit faster, that stretches you and strengthens you. And yes, I mean those metaphorically as much as physically. Grab a buddy, set a weekly goal, or listen to music for motivation. Choose a form of movement you love and DO it with utter abandon! You might even lose a few pounds in the process. The most not-so-surprising side effect of movement is that it’s the only way to get out of a rut. Whether you’re stuck in a job, a relationship, an illness, how you feel about your body or your life in any way, you need momentum to help you climb out. You’ll never rise out of that stuck place if you don’t take that first step. My tendency is to get lost in my head and disconnect from my body. I get stuck in the overwhelming inertia of shoulds to the point that I get nothing done. The beauty of engaging your body is that it requires movement, it was made for movement, and being connected to that helps you move forward in your life. Clear that one thing that’s been nagging you from your To Do list for far too long, and notice the burst of energy you feel when it’s done. Take an hourly dance break from your computer. Grab the dog or the kid and go run around at the park. Moving forward isn’t always easy and it does take some effort to get started. But oh, to revel in the expansion you’ll experience when you do! What type of movement did you enjoy today? And how did you feel when you were done? Be it exercise or inner work, a step for your business or an improvement in your home, I want to hear about it in the comments. When you share your thoughts, you open the possibilities for others. Like what you read? Pass it on! Use any (or all!) of the social share buttons below.